Heat oven to 425°F. Line 18x13-inch rimmed pan with foil. Place large rack in pan; spray rack and foil with cooking spray. In large shallow bowl or pie plate, mix melted butter and pepper flakes. Add asparagus; toss thoroughly to coat. Divide asparagus evenly into 8 bundles. Wrap each bundle in one slice of bacon. Do not overlap the bacon. If desired, secure each bundle with 2 toothpicks; place toothpick-side down on rack. Drizzle with any remaining butter mixture. Bake 30 to 36 minutes, turning once, until asparagus is tender and bacon is cooked through. Serve with lemon wedges. To prepare asparagus, break off the woody end of the vegetable as far down the stalk as is easy to snap. Asparagus varies in thickness. For this recipe, thicker spears work better. When shopping for asparagus, choose firm, bright-colored stalks with tight tips. Store in a plastic bag in the refrigerator for up to three days. The butter mixture will cling to the asparagus better if the asparagus is cold. Use regular-cut bacon for this recipe. Thick-cut will not cook through by the time the asparagus is done. 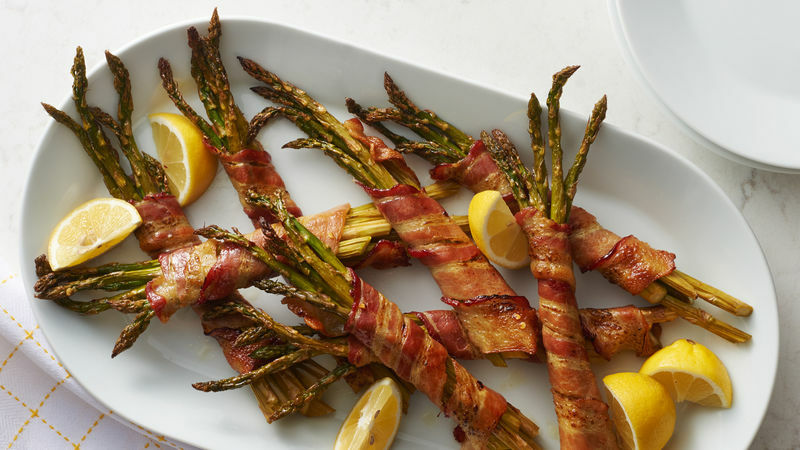 Using toothpicks makes it slightly easier to turn the asparagus during roasting, but they aren’t necessary if you are careful not to pull the bacon away from the bundles at each end. Choose a large, rectangular flat rack that fits inside of the pan. Using the rack helps the bacon cook evenly, but don’t skip the step of spraying it! Thoroughly spraying the rack prevents the bacon from sticking. Lining the pan with foil makes cleanup a breeze and protects your pan from bacon drippings that might burn and discolor the pan. When asparagus starts flooding the supermarket, you know it’s spring! We love loading up on this vegetable while it’s in season, because it’s a whole lot more affordable than other times of the year.